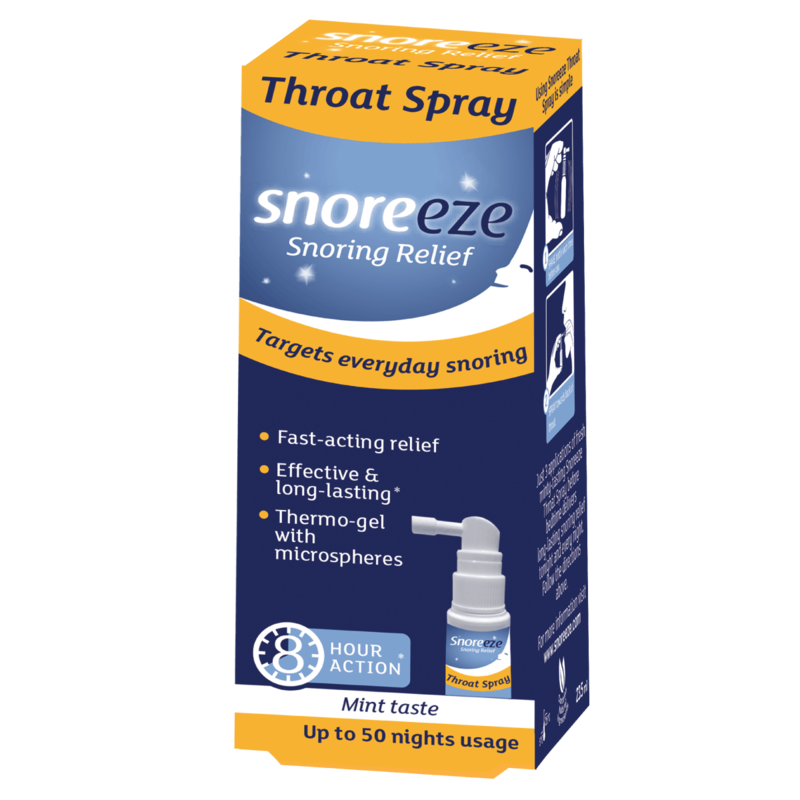 Snoreeze Throat Spray targets the main cause of snoring: dehydration and vibration of the soft tissue at the back of the throat. The thermo-gel formula tones and lubricates this soft tissue to provide up to 8 hours of snoring relief. How does Snoreeze Throat Spray work? Snoreeze Throat Spray targets the main cause of snoring: dehydration and vibration of the soft tissue at the back of the throat. The thermo-gel formula changes consistency in response to your natural body warmth. It thickens to ensure the microspheres encapsulating the key ingredients stay where they most effective – soothing and lubricating the throat for up to 8 hours. 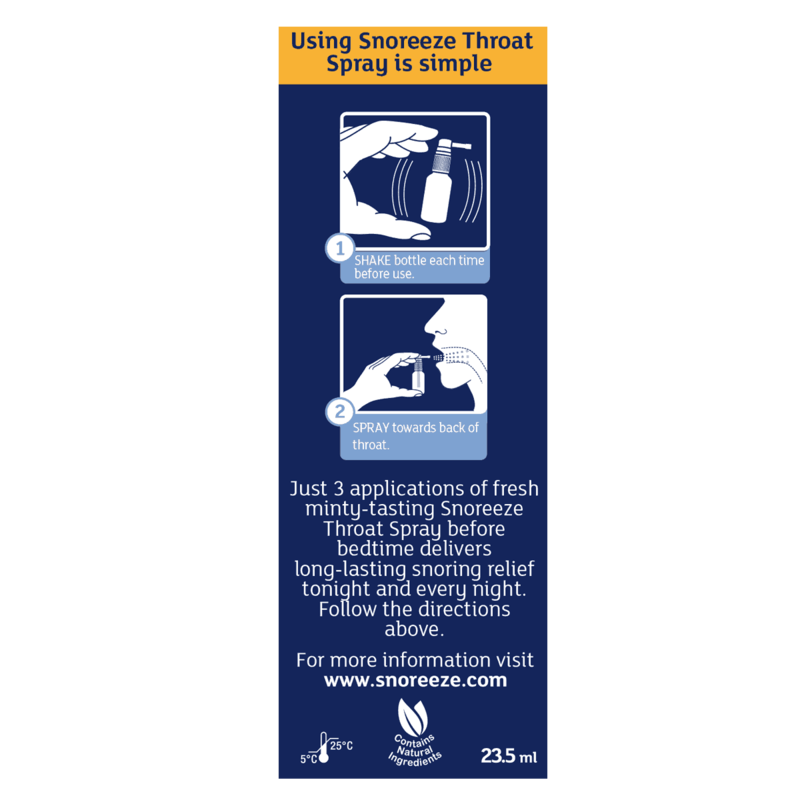 Snoreeze Throat Spray is available in 23.5ml providing up to 50 applications. For best results, don’t eat or drink after applying Snoreeze Throat Spray. More than one application of Snoreeze Throat Spray can be taken, but usually one application is enough. For oral use only. Keep out of reach of small children. Spray pump contains small parts. Store in a cool, dry place below 25°C. Snoreeze Throat Spray should be used at room temperature. Snoreeze recommends that if you are pregnant or breastfeeding you should contact your doctor before use. There is no guaranteed ‘cure’ for snoring. 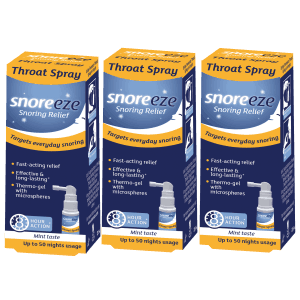 However, Snoreeze Throat Spray can relieve the symptoms of snoring to help provide a peaceful night’s sleep for you and your partner. 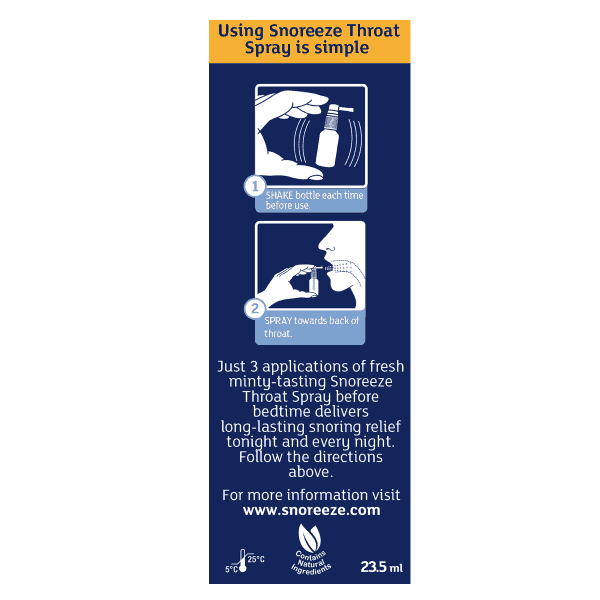 Snoreeze Throat Spray is not a cure for sleep apnoea (a related respiratory medical condition). You may be suffering from sleep apnoea if you stop breathing during sleep, wake up tired or fall asleep easily during the day. If you experience any of these symptoms it’s recommended that you consult your doctor. Aqua, poloxamer 407, sorbitan stearate, polysorbate 60, glycerol, peppermint oil, hydrochloric acid, calcium citrate, potassium sorbate, sodium benzoate, tocopheryl acetate. Vegetal origin. 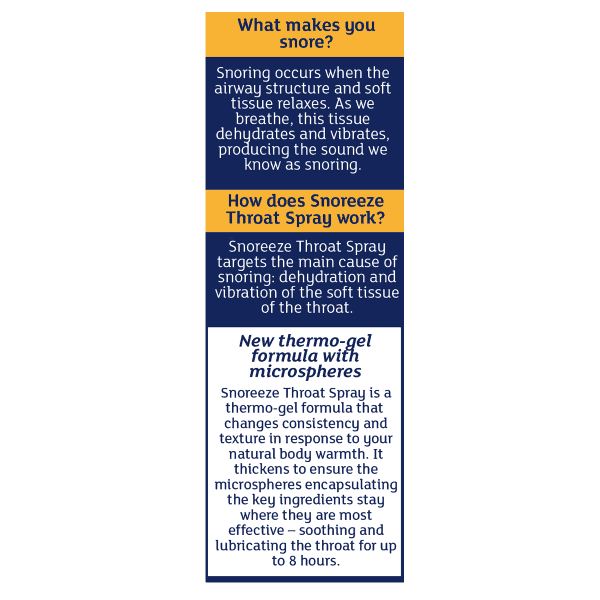 How does the Snoreeze Throat Spray work? Snoring occurs when the airway structure and soft tissue in your throat relaxes. As you breathe, this tissue dehydrates and vibrates, causing the sound we hear as snoring. The Snoreeze thermo-gel formula changes consistency in response to your natural body warmth. It thickens to ensure the microspheres encapsulating the key ingredients stay where they most effective – soothing and lubricating the throat for up to 8 hours. 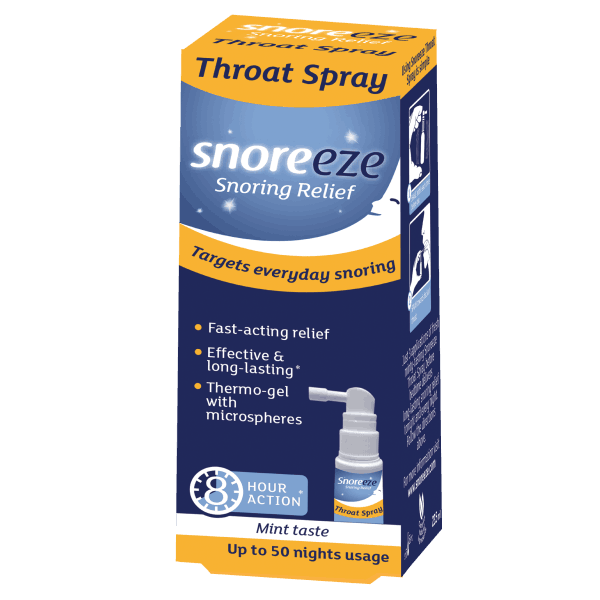 Is it safe to use Snoreeze Throat Spray every night? Can I use Snoreeze Throat Spray if I’m taking medication? 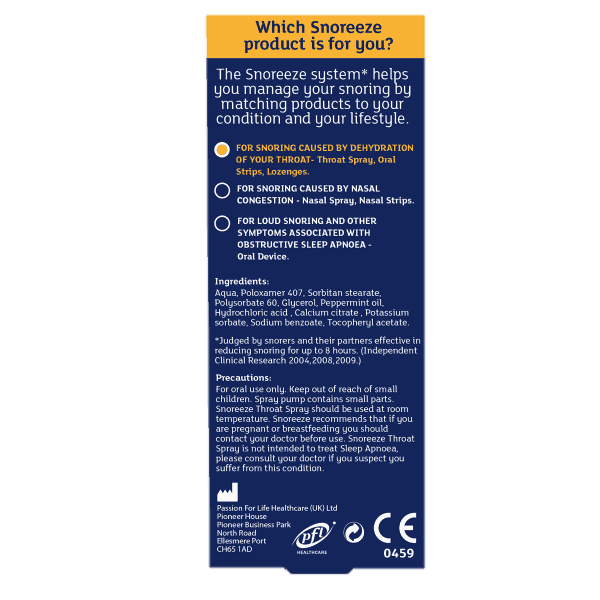 Can I use Snoreeze Throat Spray if I suffer from asthma or any other respiratory problems? Can I use Snoreeze Throat Spray if I’m pregnant or breastfeeding? “My snoring was keeping my wife awake during sleeping time. Although I have clear throat and nasal passages, I found out that the cause of my snoring was Palatal Flutter.